specific needs of RENAULT vehicles. 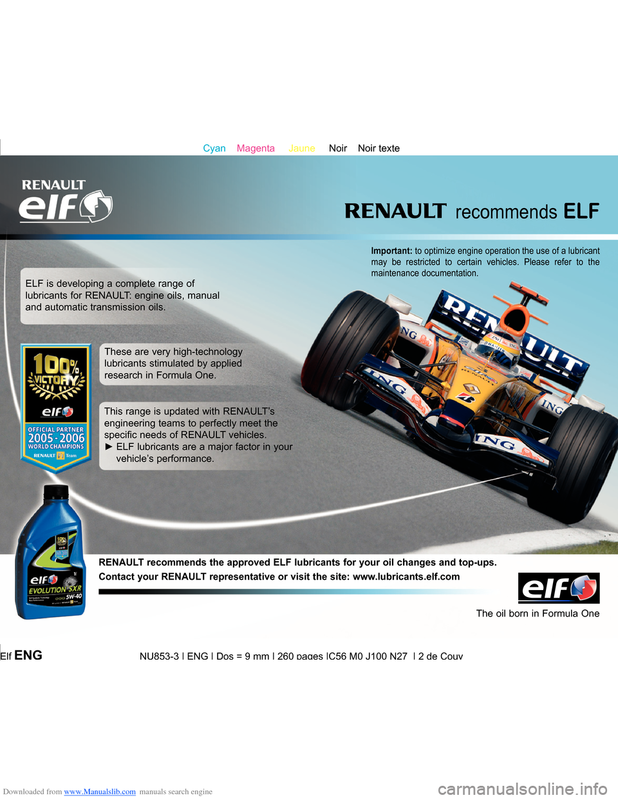 RENAULT recommends the approved ELF lubricants for your oil changes and top-ups. * Warning: these actions do not constitute an exhaustive list. 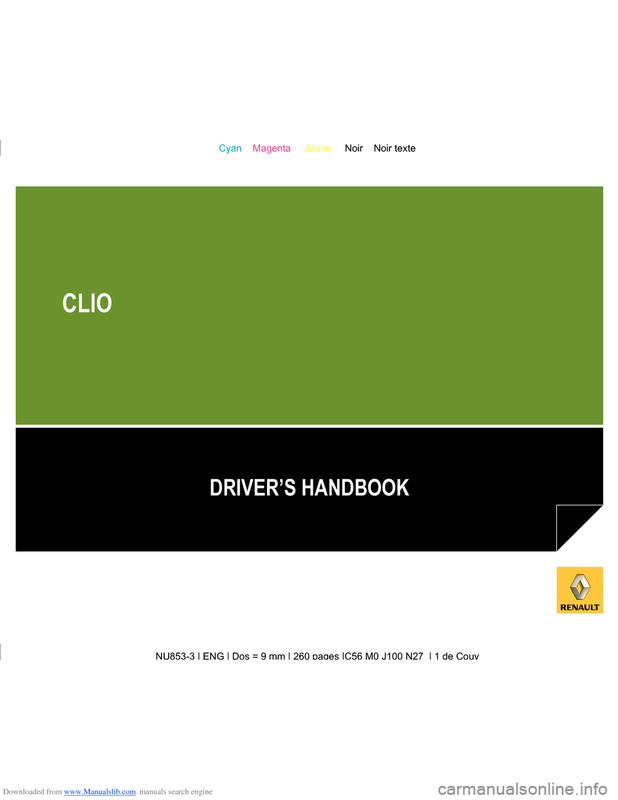 Refer to your Driver’s Handbook for more information. height = top of your head. Translated from French. Copying or translation, in part or in full, is forbidden unless prior written permission has been obtained from RENAULT, 92 100 Billancourt 2009. 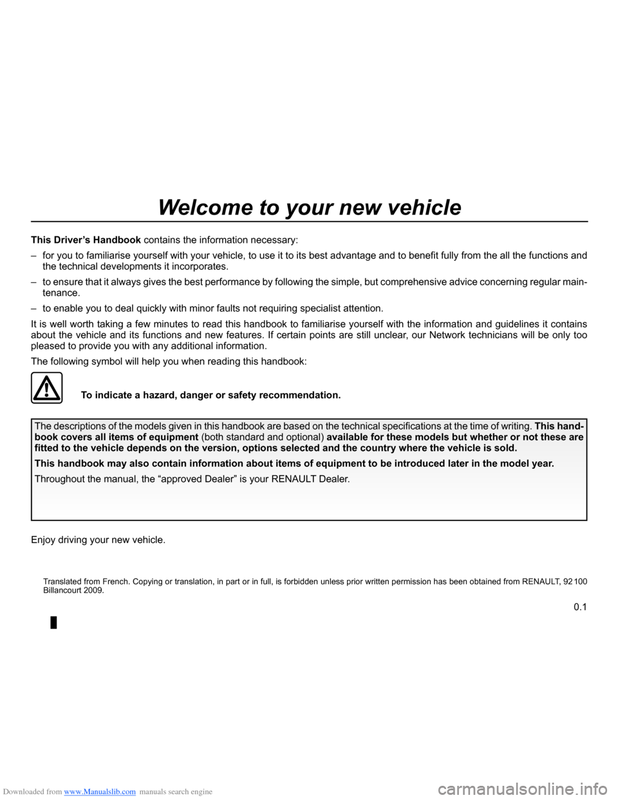 It is well worth taking a few minutes to read this handbook to familiarise yourself with the information and guidelines it contains about the vehicle and its functions and new features. If certain points are still unclear, our Network technicians will be only too pleased to provide you with any additional information. 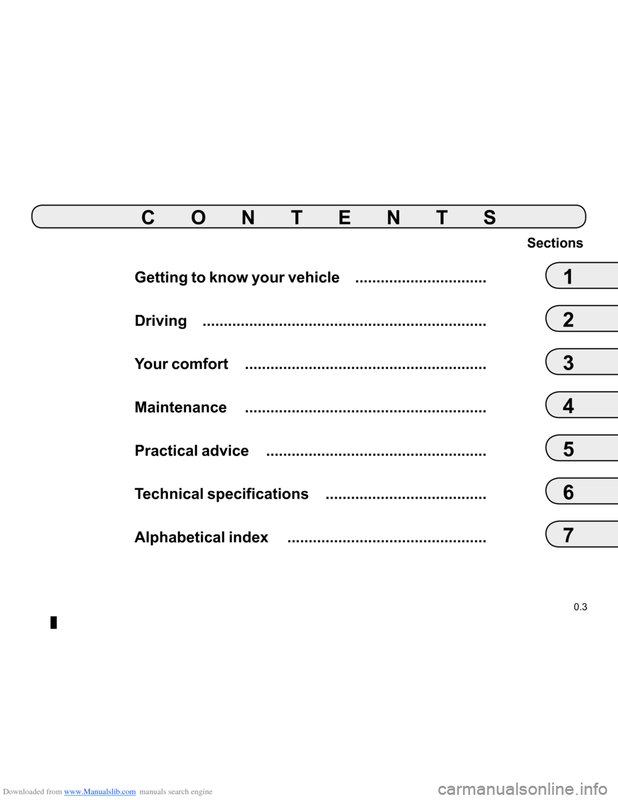 Throughout the manual, the “approved Dealer” is your RENAULT Dealer. 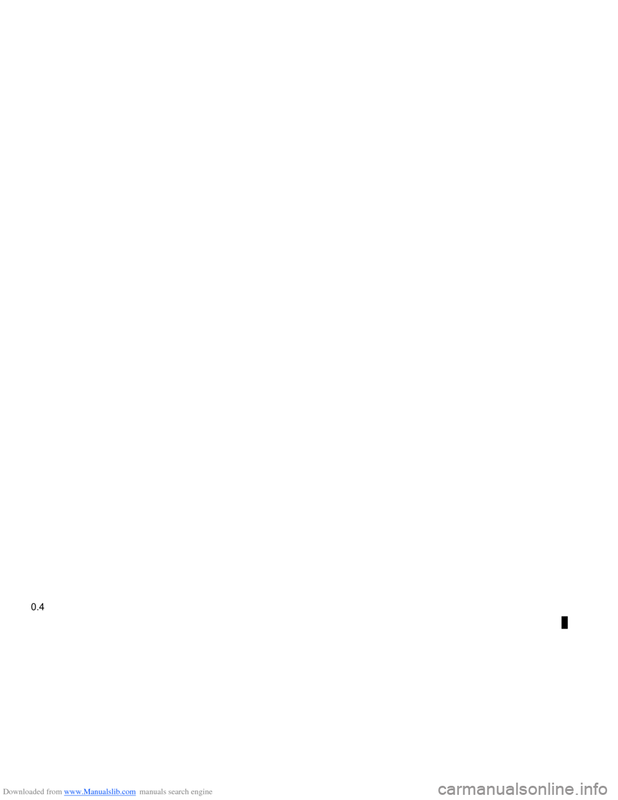 To indicate a hazard, danger or safety recommendation. 4 Locking/unlocking the tailgate only (for remote control units with three buttons). ing, press button 4; it will come out automatically. insert until it is stored. Avoid leaving the remote control in hot, cold or humid areas. 1 Coded key for ignition switch, doors and fuel filler cap. 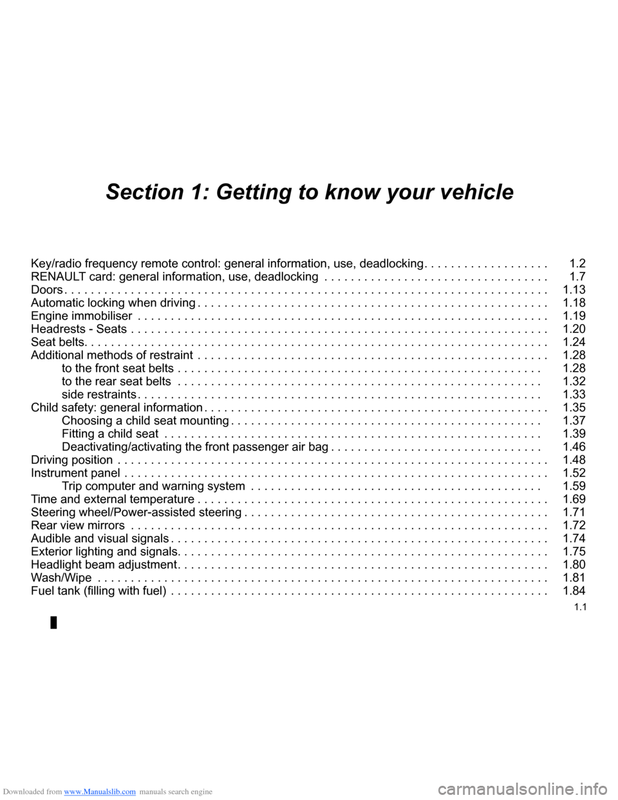 Key 1 must not be used for any function other than those described in the handbook (removing a cap from a bottle, etc.). Driver’s responsibilityNever leave your vehi- cle with the key inside and never leave a child (or a pet) unsupervised, even for a short while.They may pose a risk to themselves or to others by starting the engine, activating equipment such as the electric windows or by locking the doors.Risk of serious injury. This varies according to the environ- ment. 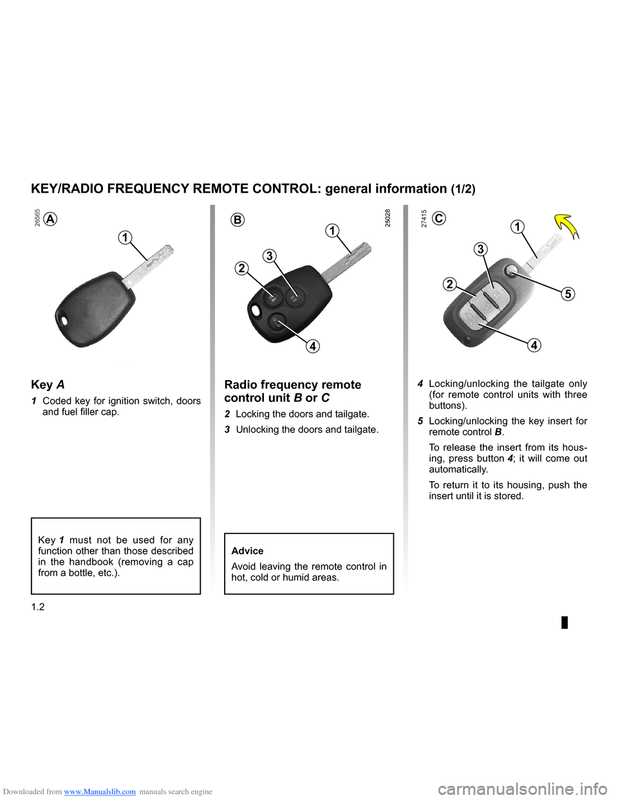 It is therefore important when handling the remote control to ensure that you do not lock or unlock the ve- hicle by inadvertently pressing the but- tons. with strong electromagnetic radiation, etc.) close to the key may create inter- ference and affect the operation of the system. Replacement and additional keys or remote controls. be necessary to take the vehicle and all of its keys to an approved Dealer in order to initialise the system. have the option of using up to four remote controls. Make sure that the correct battery type is being used, and that the battery is in good condition and in- serted correctly. These batteries should have a service life of approx- imately two years. 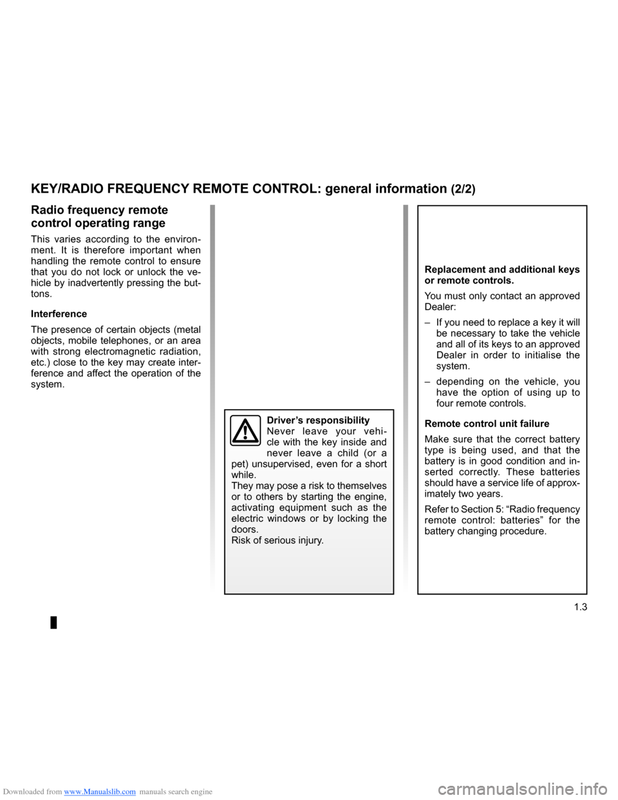 Refer to Section 5: “Radio frequency remote control: batteries” for the battery changing procedure. 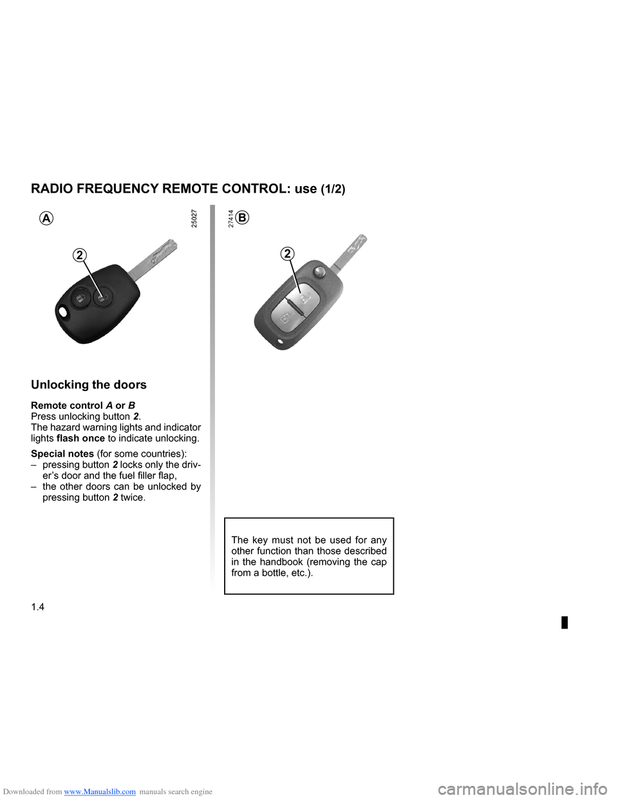 Remote control A or BPress unlocking button 2.The hazard warning lights and indicator lights flash once to indicate unlocking. – the other doors can be unlocked by pressing button 2 twice. The key must not be used for any other function than those described in the handbook (removing the cap from a bottle, etc. ).